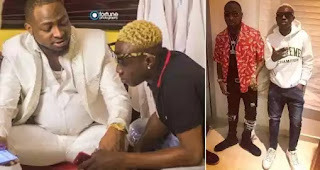 Nigerian Rapper, Zlatan Ibile, who has been the one taking care of viral online sensation, Segun Wire was beaten black and blue, allegedly by the family of the lad. The fast rising rapper was reportedly beaten ruthlessly yesterday for taking away the little boy away from his family even though it was apparent that his actions were in help of the little boy. News of the ugly incident reached Davido and in reaction to this, he has promised to deal with everyone involved as soon as he gets back to the country.